The Farm Bill is finally making progress. The House and Senate have both appointed conferees to try to work out the differences between the two chambers’ versions of the Farm Bill, and the conferees are meeting this week. One of the issues under discussion is the FDA’s proposed food safety regulations under the Food Safety Modernization Act (FSMA). FDA’s proposed regulations pose a significant threat to sustainable farmers and food producers across the country. While small-scale, direct-marketing producers are protected by the Tester-Hagan exemption, it does not solve all of the problems with FSMA. First, there are problems with FDA’s implementation of the Tester-Hagan exemption. Second, there are many good family farmers and food producers who do not have access to direct markets or who sell more than allowed under the exemption, but who are not big enough to absorb the costs that will be imposed by the FDA’s proposed rules. The FDA has failed to provide a sound scientific basis for many of the requirements, choosing instead to take a “guilty until proven innocent” approach to traditional farming methods. This places unfair and unnecessary burdens on farmers who use sustainable inputs such manure and compost teas, as well as those with diversified livestock-crop farms. Please add your voice and speak up for our farmers and food producers today! The Farm Bill conferees represent about half the states in the country. If you live or work in any of the States listed in the chart below, please call the conferee from your state. STATE REPRESENTATIVE/SENATOR DISTRICT PHONE NO. If you don’t live in one of the states listed above, call your Representative and Senators and ask them to speak to the conferees on behalf of their constituents. Find out who represents you by going to www.house.gov and www.senate.gov or by calling the Capitol Switchboard at 202-224-3121. Call and ask to speak to the staffer who handles agricultural issues. Explain that you’re a constituent and that high-quality food is very important to you. Ask your Congressman to speak to the Farm Bill conferees to urge them to support the Benishek Amendment in the House version of the Farm Bill. Get the staffer’s email address and follow up by sending them a copy of your comments to FDA (see Take Action #2 below). 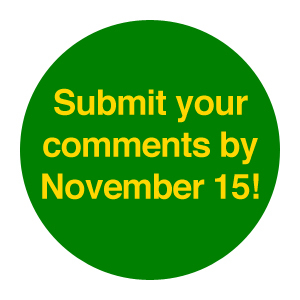 If you haven’t already submitted comments to the FDA, time is running out! Comments must be received by the agency by Friday, November 15, 2013. We have a sample letter posted on our website or you can download a Word version for editing. 1) We recommend that you write your comment ahead of time and save it on your computer — there is a time limit when using the Federal Register System, and you may get timed out if you write your comment from scratch. 2) If your comment is less than one page, you can copy and paste it into the comment box. If it is longer, you can instead write “see attached” and UPLOAD a separate document, such as a Word or PDF file, with your comments. 3) Uncheck the box that says “I am submitting on behalf of a third party,” so that you do not have to enter an organization name. 6) Check the box that you have read and understood the statement, and be sure to click “submit comment.” You should be taken to a new screen with a confirmation number. 7) Remember that the Tester-Hagan provision is found in both rules, so if you file comments online, be sure to submit them on both rules.